It has been three years since modern metal band Selfmachine released their debut album; Broadcast Your Identity (2014, see review). Over these years the band's line-up has been pretty consistent, so again vocalist, grunter and screamer Steven Leijen, bass player Mark Brekelmans and the guitar tandem John Brok and Michael Hansen recorded the album Societal Arcade together with drummer Ben Schepers. The latter however left the band right after the recordings in mutual agreement and was replaced by Robin Boogaard. When you listen to the album, you can hear the progression the band has made, not only the compositions hail a wider spectrum but the focus of Steven's vocals has slightly shifted and emphases more on the cleaner parts instead of the growls and screams. The thirteen tracks on Societal Arcade are all reasonably kept within the three to four minutes regions, focusing on the compositions over technical escapades. The down tuned riffs on the album's opener Against The Flow reminds me of the debut album, but the growl / normal voice combination shows Steven has matured in his normal voice parts and the balance has slightly turned in favour of the non-growl department. On the following Join The Hatetrain a more modern mainstream touch is added, it feels if a band like Staind added an extra string to their guitars and incorporated grunts to their sound. Resulting in a very accessible composition. Accessible is also the keyword for the first single of the album; Giddy-Up! ; although the song has a brutal speed and feel, the beautifully sung refrain parts are so catchy and add the overly present part of humour into Selfmachine's music. So let's dance to this one. When I was referring to progression earlier, Normal People and Universe are good examples to listen to, here the evolution from pure brutal parts to cleaner focussed parts are combined to accessible songs, but still with a powerful bite. I guess the modern, alternative music of Staind could have been of influence when No Cliché was composed, it also can be just a coincidence Steven's clean vocals resemble Aaron Lewis's. This ballad style composition also includes the perhaps obligated, but impressive cliché guitar solo. Hunches of Korn appear when Nothing's Worth follows; a track that shows nice powerful riffing and some subtle bass parts. Lifeblind, The Valeyard and Superior are referring to the power of the previous album, but also show the vocal progression, that was spoken of earlier. What still impresses every time are the majestic guitars and bass that form such a solid base for those tracks. Take Avenge The Moment's opening riff; two guitars in stereo, just amazing. Perhaps the strongest track on the album. The album's final track Luminous Beings shows the perfect build-up of a composition; a very smooth opening gently builds towards a powerful section, which includes a wonderful guitar solo. Ending smoothly as it started. 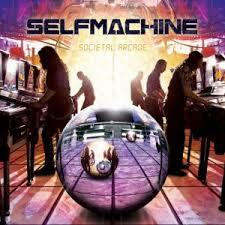 Selfmachine definitely has grown as a band, I was quite impressed with the band's debut, but the compositions have matured and Steven's vocal abilities have gained an extra dimension, which he has totally used in his advantage on Societal Arcade. Unfortunately for the band, their newly aquired drummer quit the band, due to personal circumstances, therefore Selfmachine is in search of a new drummer to join the band. In the meantime befriended Remmert Vosbergen will fill in on drums for the upcoming shows.